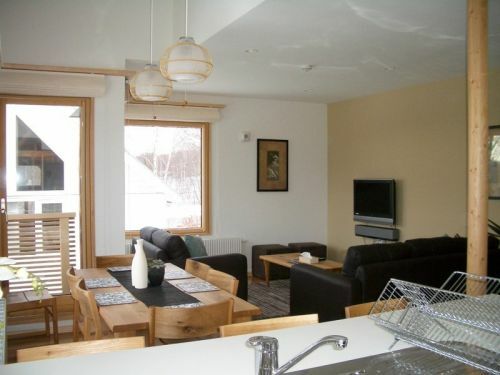 This centrally located townhouse is perfectly suited to small groups and families looking for modern and stylish western style accommodation within easy reach of the ski area, restaurants & bars, convenience stores, onsens and the local village shuttle bus. Featuring contemporary Japanese architecture and design, Hatsuyuki comes complete with furnishings & spacious interiors designed to please the most discerning customer. Hatsuyuki comprises of a spacious lounge and dining area complete with state of the art entertainment including satellite tv with english channels, broadband internet, a fully equipped kitchen with dishwasher, microwave, oven and double sink, western bedrooms offering double or twin configurations, laundry room with washer,dryer and ironing facilities, individually controlled heating and more. Hatsuyuki caters for up to 10 people and is able to be sold in many combinations such as a 3bedroom, 2bedroom or 1bedroom apartment. Note* Some combinations may not be available in peak periods. We offer great packages and take the hassle out of planning you holiday. We even make it easy for you with In-Resort Services!